An aerial view of the beautiful Mar Menor. If you want to relax, come and soak up the sun on one of the many beautiful beaches on the Mar Menor. This map shows the area of the Mar Menor, which is about 16 km from the apartment. The Mar Menor is a 130 square km inland sea where the depth does not exceed 7 metres. It is a huge salt lagoon formed by the strip of land known as La Manga and is contained by a narrow strip of land which separates it from the Mediterranean Sea. The lagoon cannot be circumnavigated by car as the strip of land is broken at the northern tip. This lagoon is ideal for all kinds of water sports and its warm, shallow water make it an ideal place for all the family. Some of the beaches we like to visit on the Mar Menor include: Lo Pagan, Santiago de la Ribera, Los Alcazares. Some of the villages on its perimeter are San Pedro del Pinatar, Santiago de la Ribera, San Javier, Los Alcazares, Los Urrutia and also La Manga. La Manga is actually built on a sand bar and is 22km long but only 200m wide in parts. Once you drive north of the beaches on the Mar Menor, you are back on to the Mediterranean coast. The beaches where there are exciting waves, include Las Palmeras at Dehesa de Campoamor and Guardamar del Segura. Why not do a circular walk at Lo Pagan! After a coffee and a comfort break at one of the outdoor cafes at Lo Pagan, you can start along the mile-long walk-way; the Mar Menor is just metres from you on your right and the curative mud baths just metres from you on your left. When you think the walk-way runs out, you can turn left at the end. This takes you through some sand dunes and you end up on the Mediterranean coast on a long, almost deserted beach. Near the end of the beach is a marina. Take a welcome break at the marina's Yatchsman (owned by an Englishman, Nigel and his French wife, Isabelle) and have a well-deserved full English breakfast. Walk it all off on the home leg, passing the nature reserve where birds are in abundance on the salt flats. If you don't take a break at the marina, it take in excess of two hours to do this circular walk and is about seven miles in length. However, if you stop at the marina for something to eat or drink (and of course a comfort break) it will take longer. It is a lovely walk. How about doing the coastal walk at Cabo Roig? Drive to Cabo Roig (on the way to Torrevieja). Walk on the coastal edge following the contour of the coast from Cabo Roig to Playa Flamenca. You can either walk back the way you came, or come back from the sea and back along the main road to Cabo Roig. If you want more accurate details of where to park, ask at the time of booking. This is another bracing walk.. There are many ‘treasures’ to discover. As well as the obvious tourist attractions of the Cathedral and the main high street shops, if you venture off the grand via, you will find a wealth of churches, squares and cafes. 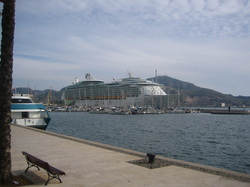 Also the Theatre Romeo, the Casino, many museums and excellent restaurants, makes this a wonderful place to visit. Click on this link to visit this excellent website to find out more about this wonderful, vibrant city. Cartagena is a famous naval port which in recent years has been turned sympathetically into one of the regions' major tourist attractions. It was originally founded by the Carthaginians in 230 BC, and has been at the centre of many conflicts including the Romans, and as such this ancient city is of great historical interest with many artefacts to be found in museums and archaeological sites. It is great to explore both the new and the old including Roman and Byzantine ruins, a Roman theatre, ancient walls, castles and churches. It is renowned for being a resting place for Hannibal and his Elephants on his journey to conquer Rome. This is now celebrated in a fantastic Roman Fiesta held in September – not to missed. Cartagena now has a modern city centre with good shops, restaurants and parks in which to relax. Shopping in Cartagena is easy to enjoy, the commercial area is compact and there are no hills to worry about. In fact, most of the shops can be found in a straight line that runs in from the underground car park at the waterfront. Park there and, with your back to the sea, face the city wall, cross the road and walk to the left. Pick up a map at the tourist booth. At the corner of the wall, head inland. You will see a bench with a statue of a sailor sitting on it and then another statue of a sailor walking along. The newly-restored former town hall is on the left. A good place to stop for a coffee, breakfast or lunch, is VIPs restaurant, which is half a minute’s walk up Calle Cañon, on the right. Or, there is the Valor chocolate café, in front of the old town hall, which serves delicious hot chocolate and other treats but no coffee. From the old town hall just walk straight ahead into the pedestrianised Calle Mayor, always the fashionable heart of Cartagena. There are shops on the left and, as you walk further on, to both the left and right. Then you will come to the end of the Calle Mayor and a street with traffic. 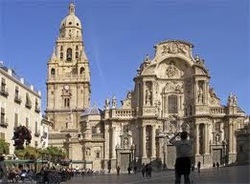 This is the Puerta de Murcia, with plenty of shops. Carry on, past the ugly Barclay’s Bank building, and you will see a beautiful building with a statue of a boy, one of Cartagena’s famous street urchins, in front of it. This is the Pedreño House, now a bank, but once the palace of a very wealthy family where balls were held. If you can manage to get in, there is a terrific ballroom with chandeliers to see. Head to the right of the Pedreño House and you are in the Calle Carmen, newly pedestrianised and smart. There are lots of shops here. Walk along until you come to a roundabout, at the end of the pedestrian area. Turn around there and walk back to the car park at the waterfront. Among the shops you will see on your stroll are the big Spanish brands, such as Mango, Zara and Berushka, but there are lots of interesting little local shops as well. Shoe shops are well represented. Some of the smaller shops close during the afternoon, from about 1.30pm, but the big brand shops are open all day. The late afternoon and evening, from about 6pm to about 9pm, is a great time to go shopping and you will find all the shops open and the local people out for a stroll. A huge out of town shopping centre, Parque Mediterraneo, with in excess of 130 shops, can be found off the A30 motorway, a couple of miles north of Cartagena, at the Cabo Beaza Industrial Estate. There is, of course, a mass of free parking. Click on this link to discover places to visit north of Murcia, include Torrevieja, Alicante, Benidorm, Guadalest and Altea. Torrevieja is a busy, interesting town about 40 minutes drive from Hacienda Riquelme. There is a good mixture of culture, shopping and nightlife, as well as the wealth of restaurants and beach-side cafes. 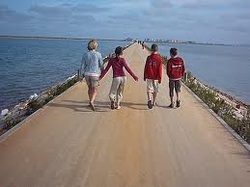 Not only is there a lot to do in the surrounding areas of Torrevieja, but there are many things in Torrevieja as well. The beaches are huge attractions in Torrevieja, which are also great for relaxing! There are many other recreational activities as well, including nature walks, rock climbing, or even golf. In fact, if you like to shop there are many exciting as well as unique places to go. For those that like to have fun, there are many places to go during the night where you can dance and enjoy a glass or two of sangria. There are dozens of restaurants and bars, as well as places to stop and have a coffee or a beer, either in the centre of the city or within metres of the sea. You can visit the Museum of Sea and Salt, as well as taking a boat ride to see the Torrevieja Harbor. You will enjoy walking around the town square and visiting many of the historical attractions such as the Church of the Immaculate Conception. In fact, this area has a diverse and colorful culture which many people enjoy because of all the events and festivities. Not only that, but people are able to learn of the culture and the local way of life. Torrevieja is well worth a visit. Aqua Natura Murcia: The water park, known as Zanzibar, covers a total area of 30,000 m2 and aims to recreate the Indian Ocean archipelago of the same name. It offers a really refreshing oasis of relaxation just a short distance from the centre of Murcia. Terra Natura Murcia is a new-generation wildlife park: At Terra Natura Murcia you can see more than 300 animals from 50 different species, three of which are in serious danger of extinction, plus over 500 examples of more than 50 species of trees, shrubs and ground cover plants from these regions. Fun for all the family at Torrevieja water park: The Torrevieja water park is one of the biggest water parks on the Costa Blanca, and is very popular with people of all ages. You may also hear it referred to by any of these names: Torrevieja aqua park; Aquopolis in Torrevieja; Torrevieja aquapolis and Torrevieja water park. Calblanque Nature Reserve: Calblanque is an area of exceptional beauty and tranquility with fine golden, sandy beaches and clear, sparkling waters. It stretches along 13 km of the coast and consists of beaches, peaceful coves, ancient sand dunes, stunning rock formations, beautiful walking trails and pine forests. Scuba diving in Murcia, La Manga: La Manga is already well known to Spanish divers for its top class dive sites, abundant marine life and quality of diving. But now short travel times, cheap flights and reasonably priced accommodation are making La Manga an increasingly attractive option for scuba diving holidays, short-breaks and dive packages from other European countries.